Over the last week, the confirmation of Brett Kavanaugh has been a freaking circus. It’s been a complete and total trainwreck. From the moment he was announced as the nominee, the left went nuts. They started talking about the Handmaid’s Tale and how Kavanaugh was going to turn the country into a theocratic dictatorship within a week of him taking his seat on the Supreme Court. However, over at The American Thinker, writer Michael Filozof thinks it’s really all about another topic. The Kavanaugh confirmation is about the future, not refighting the cultural battles of the 1970s. And next up on the Democratic agenda is sweeping, national gun control – and possibly even confiscation. In the 2016 campaign, candidate Hillary Clinton stated that the U.S. needed to consider the Australian model of a national semi-automatic gun ban. California congressman Eric Swalwell went even farther, explicitly endorsing an Australian-style mandatory gun “buyback” and “going after resisters” here in the U.S. Prior to the passage of the infamous “SAFE” Act in 2013, New York’s Gov. Cuomo publicly stated that “confiscation could be an option.” H.R. 5087, the Assault Weapons Ban of 2018, has nearly 200 Democratic sponsors. It includes a total ban on AR-15-style rifles and magazines capable of holding more than ten rounds, plus a national ban on private transfers. That’s where Kavanaugh enters the picture. Sitting on a three-judge panel of the D.C. Circuit Court, Kavanaugh dissented when the panel upheld the District of Columbia’s “assault weapons” ban, explicitly stating that semi-automatic firearms are protected by the Second Amendment. Presumably, his published dissent indicates how he would rule in similar cases on the Supreme Court. That’s what the Democrats are afraid of. Look at who leads the opposition to Kavanaugh: Dianne Feinstein, who stated on national television that if she could force Americans to turn in their guns, she would do it, and lifelong New York City gun-control freak Chuck Schumer, author of the 1994 “Assault Weapons Ban” – which was positively tame compared to what is coming next. You know, I don’t know that he’s wrong, either. Feinstein’s grilling of Kavanaugh on guns and definitions, including her bizarre idea of what constitutes “common use,” provide a glimpse into her thinking, and while issues like abortion are of concern for Democrats, what set Kavanaugh apart from the crowd was his gun stance. As it stands, Heller is established and it’s highly unlikely that the Court would overturn it so soon after the decision was handed down. However, that doesn’t mean the anti-gun left doesn’t hope to stem the tide of what may follow. The Supreme Court has been notoriously silent on gun control and gun rights since the McDonald decision, a point that has bothered many of us in the gun rights community. Much of that may be attributed to Justice Kennedy’s squishiness on the issue of guns. While Justice Kennedy sided with the majority on Heller, he never seemed like as strong of a supporter of gun rights as Justice Scalia, for example. With Kavanaugh on the bench, the thinking is that he will push the Court to hear more gun cases, like statewide assault weapon bans, and find them unconstitutional, which would upset anti-gun circles. Frankly, this idea terrifies them. So out come the attack dogs. 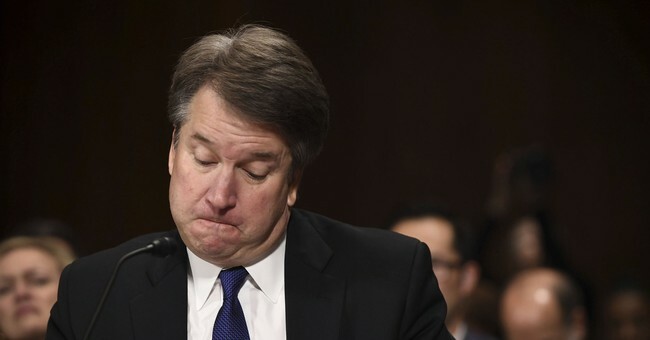 Out come the unsubstantiated allegations without a shred of evidence to support them, all in the hopes of pushing Judge Kavanaugh to step aside. Filozof may well be right.